For the fourth year in a row, the Sandy Creek Co.R.E. VEX Robotics team has earned a ticket at the Northern New York Championship to advance to the VEX World Competition. This year 346 teams competed across New York State in VEX robotics competitions to see who could design, engineer, build and program the best robot to tackle the Turning Point challenge. 72 high school teams earned the privilege to compete at the Northern New York State VEX Robotics Championship on March 2nd at the SRC arena. Teams from across New York State competed in the all-day event through qualification rounds, quarter-, and semi-final rounds in two divisions. The [Co.R.E.] E team placed 10th in the Technology Division and 12th in the Skills Challenge. The R team placed 2nd in the Engineering Division Qualifications and 4th in the Skill Challenge. The Y team placed 9th in the Engineering Division and 17th in the Skills Challenge. 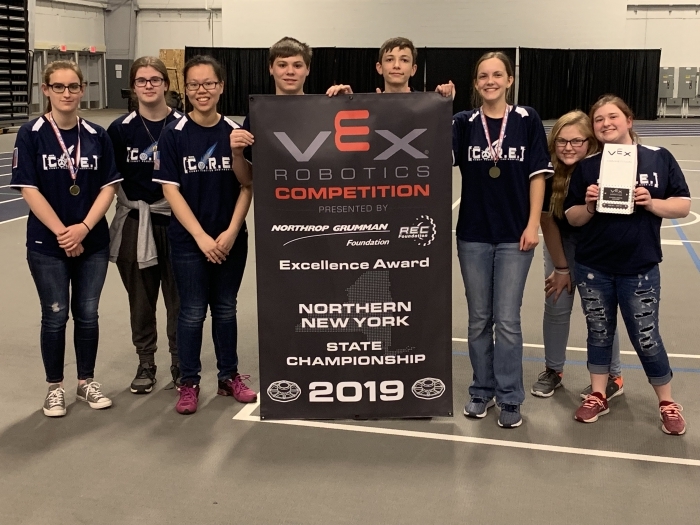 Though all 3 teams were knocked out in the quarter finals, the 34000R team won the coveted Excellence Award earning them a ticket to the VEX Robotics World Championships in Louisville, KY on April 24-27.